"It is not, therefore, by our own spirit that we are to judge of the meaning of the Holy Scriptures; but it is through the Spirit of God that we are to gain an understanding of these holy books; and this is given to us in the Scriptures themselves." 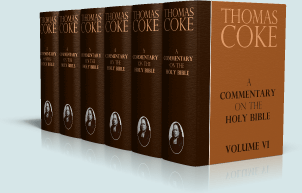 COKE, THOMAS: First Methodist bishop; bishop at Brecon, Wales, Sept. 9, 1747; died at sea on a voyage to Ceylon May 3, 1814. He studied at Jesus College, Oxford (B.A., 1768; M.A., 1770; D.C.L., 1775); took orders in the English Church and became curate at South Petherton, Somerset; fell under Methodist influences and in 1777 openly joined that body and attended the conference at Bristol. He gave much help to Wesley, who styled him "his right hand"; in 1782 he became first president of the Irish conference; in 1784 he was set apart by Wesley at Bristol as "superintendent" for America. Wesley did not approve of the title bishop, which the American conference adopted in 1787 at Coke's instigation. The latter, with two elders, arrived in America, Nov., 1784, and proceeded to the famous Christmas conference at Baltimore, at which he ordained Francis Asbury as superintendent. With Asbury he drew up the Doctrines and Discipline for the Methodist Church in America. He made nine voyages to America (the last in 1803) and fulfilled his duties there energetically and well. He was a leader in England after Wesley's death (1791), and was indefatigable in the cause of missions. In 1813 he wished an appointment from the government as bishop of India and offered to return to the Established Church; when the proposal was rejected he furnished funds himself to establish a Methodist mission there, sailed with a band of helpers, but died on the voyage. His numerous publications include Extracts of the Journals of the Rev. Dr. Coke's Five Visits to America (London, 1793); a life of John Wesley (1792), prepared in collaboration with Henry Mooro; A Commentary on the Old and New Testaments (6 vols., 1801-03); A History of the West Indies (3 vols., Liverpool, 1808-11).